Surface Of Eceyon - "Dragyyn"
Surface of Ecyeon return once again from “the vessyl”, with Dragyyn, the outstanding follow up to 2001’s brilliant The King Beneath the Mountain. This one’s going to send shivers up your spine. The opening track, Stolen Wind, builds from a low, moaning breezy intro into an energetic, psychedelic rush. And while it didn’t grab me quite as much as The Open Sea did on The King Beneath the Mountain, the album was, nonetheless, all uphill from there. Council is Called is a mystically beautiful and haunting meditation, with gentle guitar picking and high, distant drones that set the perfect tone for the next piece. Perhaps the best on the album, Over Land, Over Ice, soars with sprightly percussion in its first half, while mellow guitars bring some trippy, feel good warmth to the proceedings. The piece then dips into a frosty chill of icebound electronics and glacial drones, melting slightly as the warm guitars return near the end. Victory of Ice and Magyk is a throbby contemplation that blurs into a smooth rock trance in its second half, contrasting nicely with By a Curious Vessyl, which is pure swirling atmospherics, alive with the rustling and clicking, distant echoing voices, and shimmering guitar reverberations. Freeing the Wind brings Dragyyn to its amazing conclusion. A nearly 20-minute epic, it builds slowly from atmospherics and plucked strings to a towering, breezy rock jam full of trippy jangling guitars and squalls of noise that culminate in another mind bending finale, perhaps even better than the finale of The King Beneath the Mountain. While everything on Dragyyn is improvised, these are much more than just jams. It’s obvious that the musicians have an excellent sense of each other, as they all get into “the vessyl” and let it happen, allowing their ideas to come to life in real time. 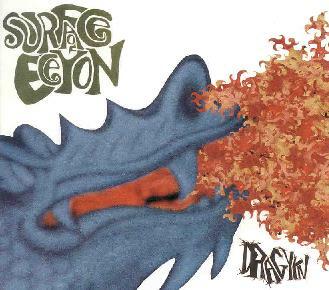 The music on Dragyyn is restless, vibrant, and never fails to surprise. It’s the kind of music that not only takes you to the edges of distant, mysterious worlds, but carries you straight on into the heart of them. For more information you can visit the Surface Of Eceyon web site at: http://www.surfaceofeceon.com. Dragyyn is distributed by Strange Attractors. You can visit their web site at: http://www.strange-attractors.com.